In 2014, Top Gear was Reserve Champion of the Oldenburg licensing and finished in the top group of stallions at his 30-day test in 2015 in Schlieckau (score:8.78). He received 10.0 for his character and 9.75 from the test rider. Ridden by Isabell Freese, he won advanced (L) level dressage competitions and qualified for the German Championships. In 2018, he continued his winning streak at intermediate (M) level dressage competitions. Top Gear consistently transmits his elegance and outstanding movement to his foals. He has already produced one premium stallion. His sire Totilas won double gold at the European Championships in Windsor/GBR in 2009 and triple gold at the World Equestrian Games in Lexington/USA in 2010. 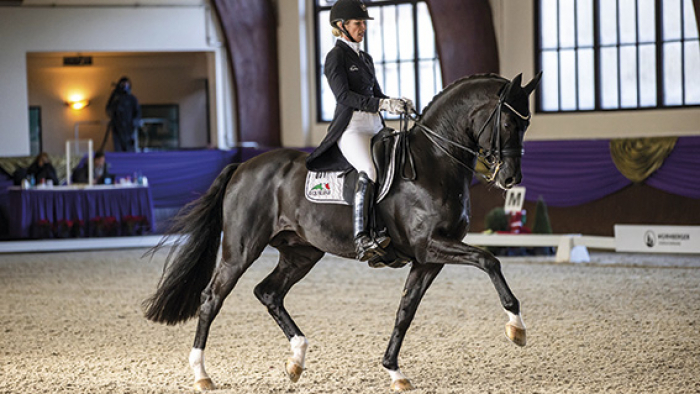 Dam sire Don Frederico was champion of the Hanoverian licensing, finalist at the German Championships and won advanced (S) level dressage competitions. Grand-dam Saniza produced two licensed stallions: Rosandro (by Rosario) and Royalist (by Royal Hit). Top Gear: Totilas x Donnerhall: a higher performance guarantee is impossible! Top Gear is stationed at Deckstation Paul Schockemöhle in Mühlen.